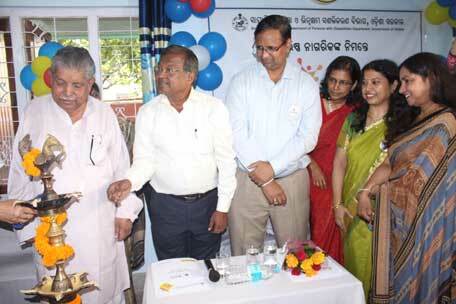 Bhubaneswar: Minister of SSEPD, Mr. Prafulla Samal, today inaugurated Odisha’s first state-supported multi-activity centre for senior citizens, ‘Anand’, at Nayapalli in Bhubaneswar. ‘Anand’ has been developed by the Social Security and Empowerment of Persons with Disabilities Department (SSEPD), Government of Odisha, in consultation with the Tata Trusts and implemented by HelpAge India. Mr.H.S.D Srinivas, Director –Health, Tata Trusts, and Dr. Imtiaz Ahmed, Mission Head –Age Care, HelpAge India were also present at the inauguration. The objective of the centre is to address various needs of the elderly by developing a model of active engagement and awareness about health and wellness that will improve their quality of life. It will also facilitate happy ageing through recreational and learning activities and by providing a platform for socialization. Furthermore, the facility aims to encourage member citizens to, in turn, organise medical camps, and provide timely counselling and medical support to senior citizens belonging to BPL families as well. Among the other dignitaries present at the inauguration were Mr. Susanta Mohapatra, Director, SSEPD, Ms. Susmita Bagchi, Eminent Writer, Mr. Priyadarshi Mishra, MLA, Mr. Manashirani Sundaray, Corporator, Nayapalli, Mr. Ananta Narayan Jena, Mayor, Bhubaneswar and Mr. Prasanna Patasani, Member of Parliament. Following a MoU signed between Social Security and Empowerment of Persons with Disabilities Department (SSEPD), Government of Odisha, and the Tata Trusts in January, 2018, this centre is a step towards developing Bhubaneswar as an ‘age-friendly’ city in line with Odisha’s Senior Citizens Policy 2016.